Picking your spot is of importance when targeting bream from the shore. Plain mud or sandy flats can be pretty barren so if reasonable structure in the way of rocks or a creek mouth within casting distance isn't available then some heavy burleying may be in order. Mixtures of bread bran, chicken pellets, pilchards, fish oils, or minced fish scraps will certainly assist the cause, although should be used in moderation. We are trying to attract fish to your location, not feed them or have the burley help out the fishermen 100 metres down current. Baits should be fresh as possible, yabbies, prawns, hardiheads, or cut baits being most suitable. Fish as lightly as possible for the conditions, we want our baits to sink slowly to the bottom so as to act as naturally as possible, mimicking either injured bait fish, a settling prawn, or a tasty piece of whatever that has just been put on Mr Bream's menu courtesy of the tide or current. Lines in the 2 to 4 kg range should be suitable with a short trace of heavier line to 6kg if the bottom is rough. Hook sizes will depend on the bait you are using and the size bream you are expecting to encounter. 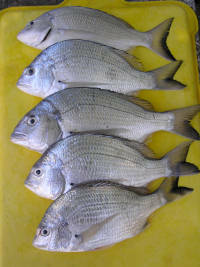 Average fish using yabbies or small prawns would probably require a number 4 long shank while a large cut piece of mullet while chasing a trophy bream would be best fished on a single 2/0 or snooded 1/0's. Your rod should have a sensitive tip to pick up the most timid of bites with firmer middle able to turn a running fish away from snags. Fish the last two hours of the incoming tide and perhaps up to an hour after it turns. Run out tides near small drains and creek mouths can also be productive. Tackle should be similar to that suggested above with a little more attention paid to the sinker which may have to be up or downsized with changes to the tide run. Anchor quietly within easy casting distance of your target fishing area making allowance for the tide you are about to fish. Bream will get right on top of structures that were previously dry in their search for food so you should keep this mind so you can cast to where the fish are throughout your trip without having to move unless absolutely necessary. Be vewwy vewwy quiet we are hunting bream you know! Noise will put these wary little fish off the bite very quickly, and a dropped rod, torch shone into shallow water or any other unusual act will almost certainly bring about a sudden end to what may have been a productive night's fishing. Rock walls, wharves, and bait banks in close proximity to deep water are all worth investigating. Although day light hours see many smaller bream caught, dawn and to a greater degree dusk and night are when most of better quality and quantity catches will be made on baits. A lightly weighted moving bait will almost always outfish a bait anchored by a large sinker. Don't be afraid to experiment with types of bait and retrieval styles, fish can respond to different stimuli in different areas at different stages of the tide, you just have to find what works for you in your area.